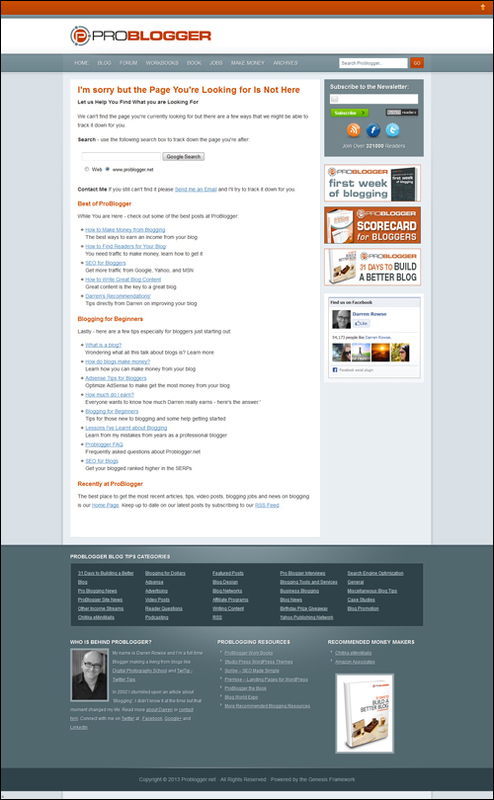 Where Is My WordPress 404 Page? When visitors try to access a page on your site that doesn’t exist, WordPress automatically displays something called a “404” error page. 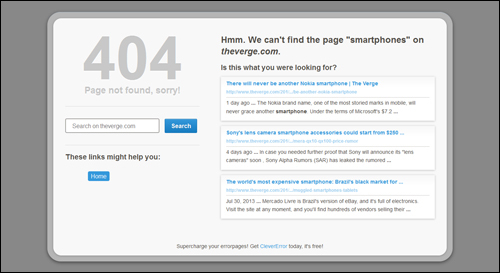 The “404” error page (also know as a ‘page not found’ error) lets visitors know that whatever they were looking for can’t be found at that URL location. Addressing 404 errors will not only make a difference to how visitors and search engines perceive your site, but it can also help you recover what would otherwise be lost opportunities to keep visitors longer on your site and potentially turn these into prospects, leads, or new customers. For example, adding links to your error page pointing visitors to useful pages on your website will improve user experience, increase visitor retention rates, and decrease bounce rates on your site. In this tutorial we’ll show you some of the ways you can customize your default WordPress 404 page to provide visitors with a better experience if they land on a wrong page and don’t find what they were expecting to see. 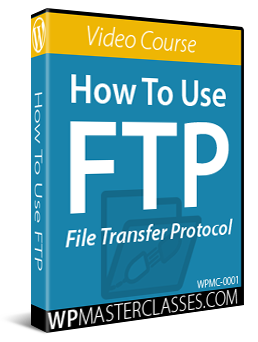 Web server files (e.g. “mod_rewrite”) have not been installed or are missing. Tip: If you are trying to use Pretty Permalinks (Search-Engine Friendly URLs) and you are getting errors, check with your webhost that mod_rewrite has been installed and is working correctly. Whatever the reason for getting a “404” error page may be, it’s important to acknowledge that your visitor has made an effort to come to your site and that they are probably going to be left feeling slightly confused or disappointed after arriving on your site and not finding what they expected to see. So … what are your options when this happens? You could just do what most people do and ignore the errors, but this will not create a positive outcome for either your visitor (disappointment) or for you (loss of opportunity). If a visitor follows a link to your site and is presented with a 404 page instead of the content they were looking for, it’s highly unlikely that they will search your site to find it. 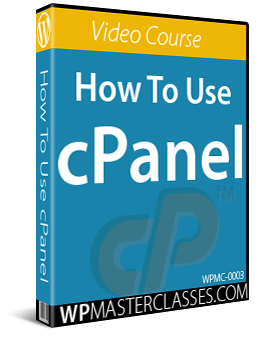 Most likely, they will simply assume that the content no longer exists on your site, and simply look elsewhere. Additionally, ignoring your “page not found” issues can affect a search engine’s ability to index your site’s pages and impact the bounce rate on your site. If anything, this is better than giving your visitors no option but to click the “back” button on their browser, leave your site and go somewhere else. Another option is to automatically send all visitors to your home page or another page on your site using a redirect script or plugin when a bad URL is detected. From a visitor’s point of view, however, this may not be very useful or helpful and could add to their confusion and/or lead to more disappointment. Be proactive: monitor incorrect incoming links, then contact the owners of the websites that are linking to your site and request that these links be corrected. 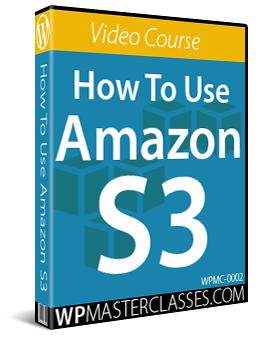 Most site owners will be more than happy to oblige. Don’t remove old content on your site unless it’s absolutely necessary to do so, and if you have to, make sure to set up proper redirection and follow correct page migration procedures. Look at your site’s analytics, or search online for terms such as “tracking inbound links”, or “reputation management tools” to find tools that can show you which sites are linking to your site. Use a plugin like Broken Link Checker to detect and redirect broken links on your site. In addition to taking steps to prevent errors, the best thing you can do is to be as upfront and helpful as you can be. Think of ways to turn errors into opportunities. Acknowledge the fact that the content they are looking for is missing and try to help your visitors find what they are looking for. At the very least, your 404 page should provide helpful information and some useful navigation options for your visitors. Explain to them why the page can’t be located and offer suggestions for helping them get to the right area of your site to continue searching. 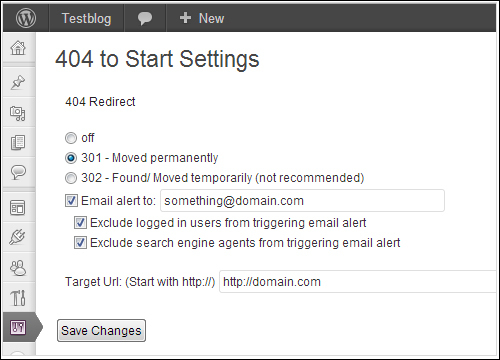 Add a notification and/or tracking system to help you identify 404 errors on your site. Once you have located the page, you can edit it to improve your visitor’s experience by placing helpful information in your 404 error pages (you can even monetize your 404 error pages by placing ads in it). Below are just some examples of simple customizations you can make to your WP 404 page. 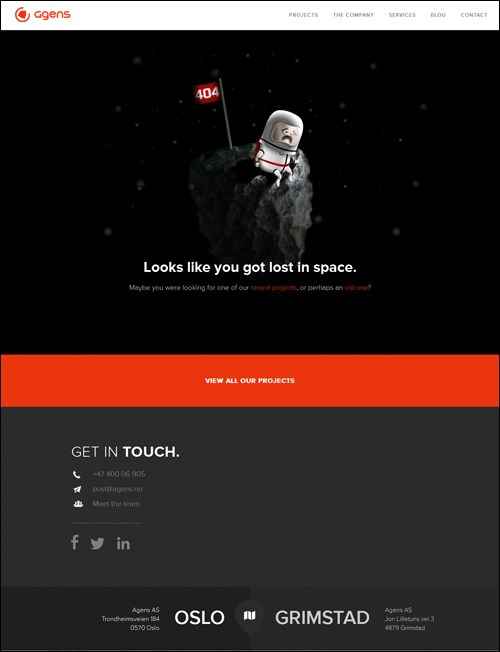 In short, you can customize your 404 error page however you like. 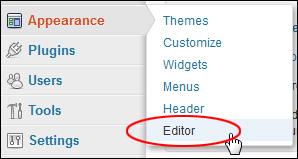 If you are not comfortable editing code, ask someone with web design or PHP experience to do it for you. 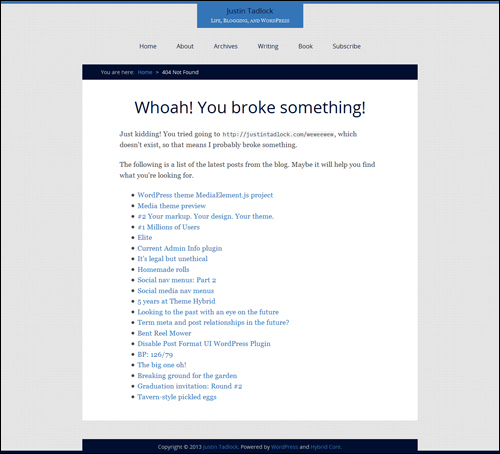 See the resources section at the bottom of this page for more information about editing your WordPress 404 page template. 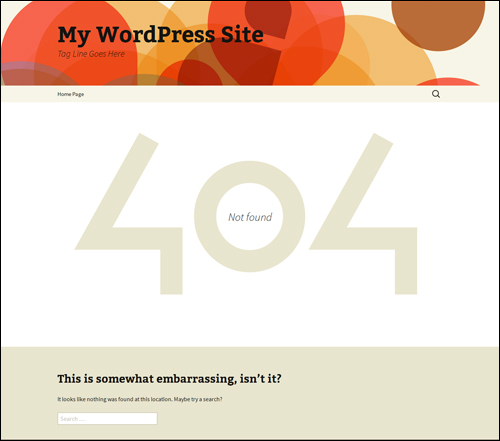 Here are some WordPress plugins that can help you customize your WordPress 404 page and/or prevent, manage, or handle WP 404 errors. 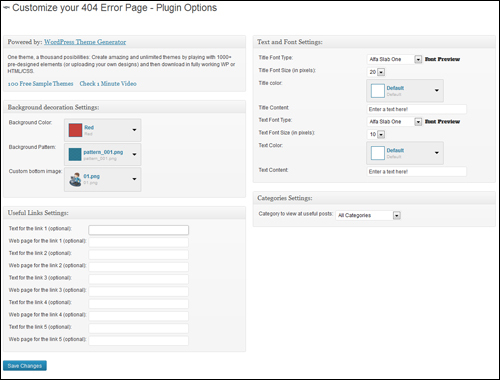 404page is a free plugin that lets you easily create a customized 404 error page in almost any WordPress theme. 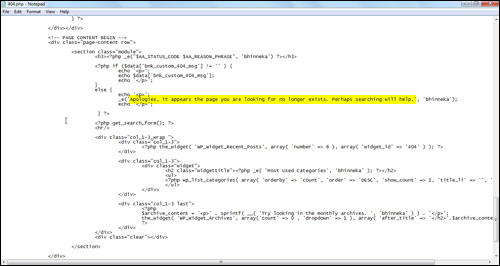 The plugin also sends a correct 404 error code that tells search engines the page does not exist and should be removed from their index. Redirects can be created based on the best possible match for the URL the visitor was most likely trying to reach. As stated earlier, always make a backup of any files you plan to modify, and if you do not want to edit code yourself, then please ask someone with experience to help you. In terms of search engine optimization, it’s better for search engines to think that content on your site has moved rather than disappeared. This plugin allows you to redirect posts that have been sent to the trash to your homepage (or to another location that you specify). 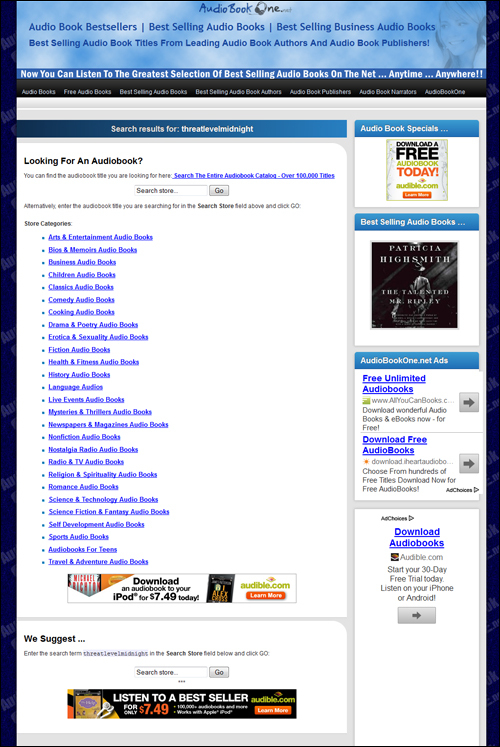 Note: This plugin is used for posts or pages (or categories, tags, media, etc.) that have been deleted from your site. If a visitor searches for something that does not exist on your site, they will be presented with your theme’s usual 404 page. 404 to Start is a simple plugin that allows you to completely bypass the 404 error page and send visitors directly to your home page, or to any other page of your choice. Note: If you plan to use a customized 404 page, then do not use this plugin, as your visitors will never see your custom 404 page – they will be sent directly to your home page or whatever page you have specified. Tip: This plugin is useful if you provide content containing links or references to posts or pages on your site that have been scheduled for publishing at a future date. Simply create a temporary notice page (e.g. “this page coming soon”) and use the 404 to start plugin to redirect all not found links pointing to content that has not been published yet to your temporary page. Remember to set the destination page as a “302” (i.e. temporary) redirect. 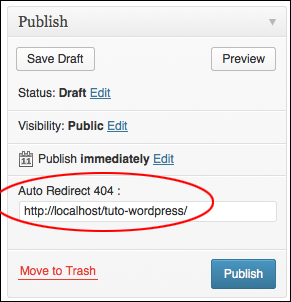 This is a simple plugin that logs 404 errors on your WordPress site. It also logs useful information like referrer, user address and error hit count. This plugin is useful for monitoring 404 errors, especially from external referrers, or if you plan to create manual redirection links. Note: You don’t need to use this plugin if your current 404 strategy already provides you with a way of monitoring 404 errors. If you’ve decided to move things around on your site, you might overlook a few redirects and end up with some broken URLs. This plugin will help you catch any broken URLs so you can fix them. 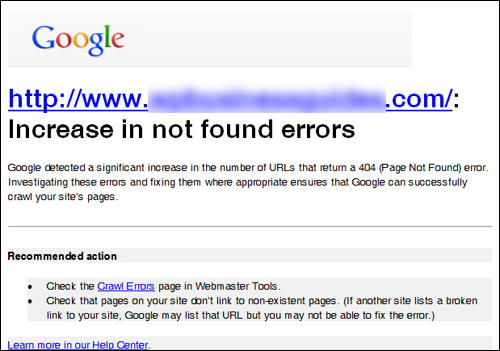 It logs 404 errors on your site and notifies you of these via e-mail or RSS. Instead of displaying an unhelpful 404 error page on your site when a visitor reaches content that doesn’t exist, you can install the Smart 404 plugin, and it will make an effort to guess what your visitors were after. 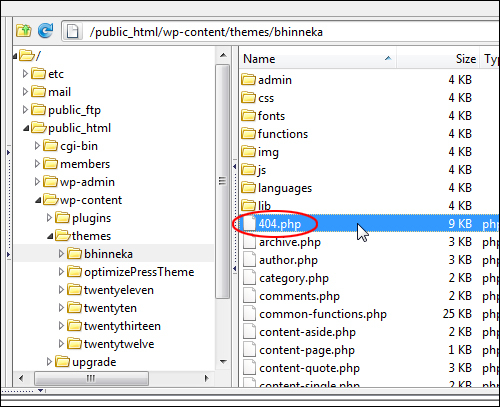 The plugin will perform a search of your posts, pages, tags and categories, using keywords from the requested URL. If there’s a match, it will redirect to that content instead of showing the error. If there’s more than one match, the 404 template can use some template tags to provide a list of suggestions to the visitor. 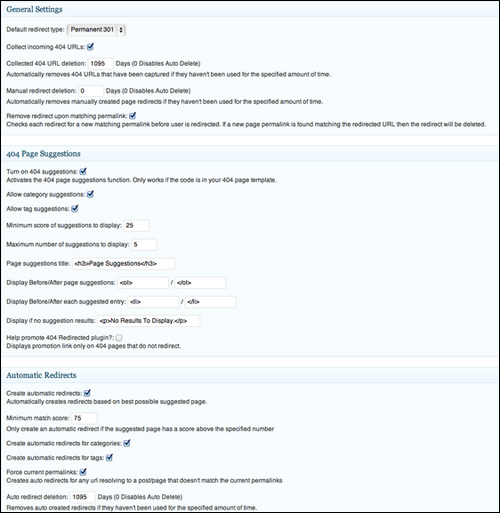 The Smart 404 plugin is also useful if you have recently changed your permalink structure. With minimal or no adjustment, old permalinks will still work. You should set up a Google webmaster account and submit an XML sitemap of your blog to ensure that the Google 404 widget will perform effectively. This plugin lets you create a custom error page similar to the one used on Dunstan Orchard’s 1976design.com/blog. 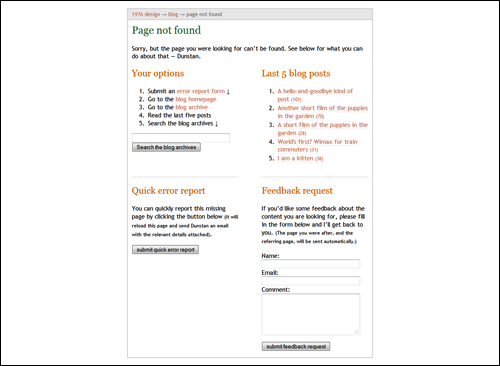 The custom 404 error page created by this plugin provides useful information to your visitors, including useful links, links to your most recent posts, a search box, the option to contact you and report the error, and more. 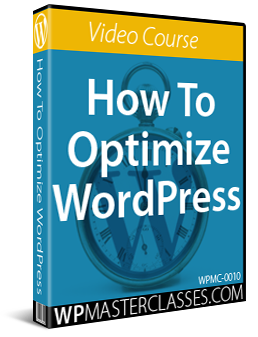 The plugins below provide more advanced or unusual options to address 404 errors on your site. 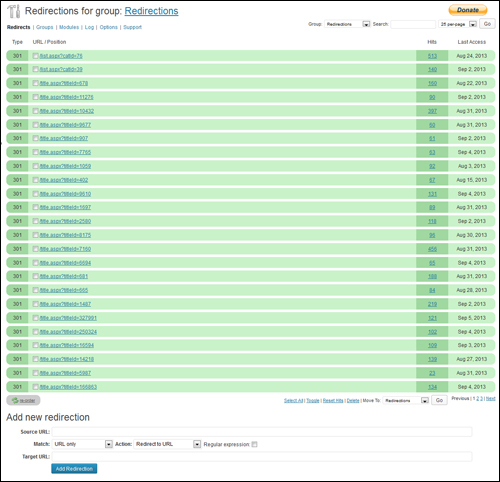 Redirection is a very useful WordPress plugin that helps you manage 301 redirects, keep track of 404 errors, and generally tidy up any loose ends your site may have. This simple but effective plugin is useful if you change the permalink structure of your site and don’t want to lose any incoming links pointing to your old page URLs. If you just migrated your WordPress blog from one permalink structure to another, and you don’t want to lose the traffic that accesses your blog through the old permalinks, then consider using this plugin. Here’s how the plugin works: Right before the old permalink generates a 404 error page, this plugin grabs the slug from the end of the request and checks to see if a post with the same slug is located somewhere else on your site. 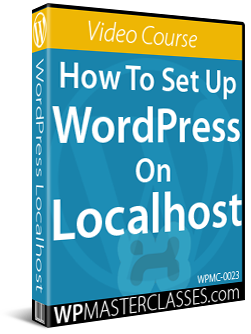 If so, the plugin will generate a “301 Moved Permanently” error and forward your visitor to the new location of your post. In addition to redirecting your visitor to the new link, it will also automatically redirect visitors and search engine spiders to the new location in the future. This plugin sends you email notifications that specify the cause of your errors, allowing you to create more useful 404 pages. The developer of this plugin credits the following article for inspiring the creation of this plugin: A More Useful 404. This plugin lets you replace images missing from your posts that return a 404 error with an alternative default image of your choice. You also have the option to add a class to the img tag or hide the image if it’s missing. Thousands of children go missing every year across Europe. Thanks to the NotFound project, you can make a difference. Install our application and a picture of a missing child automatically gets published on every ‘page not found’ of your website. Together, we can find them. 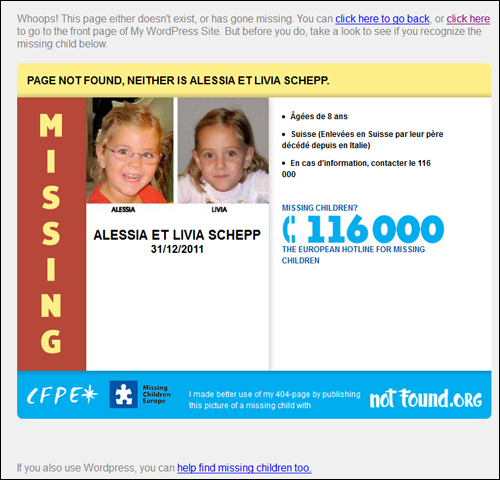 The goal of this plugin is to make it really easy for WordPress users to implement the NotFound.org missing child page instead of their standard 404 page. Congratulations! Hopefully, now you have a better understanding of what 404 errors are, and some of the ways you can customize your WordPress 404 page to provide not only a better experience for your visitors but also help to minimize lost opportunities on your site.